When the snow started to fall in November the anticipation grew for a great winter. People started brushing the cobwebs off their skis and heading up high to find good snow. The Helbronner was the place to search with the Aiguille du Midi being closed. There was some good skiing to be had but it was short lived. The temperatures rose leading up to Christmas and the snow ceased to fall. Most of the early snow melted away and Christmas came and went with no real precipitation. As the new year rolled in it brought with it some snow, a lot of snow. Powder was plentiful and there were too many deep days to count. Spending a lot of time in Italy dodging trees and the odd day up high in Chamonix it felt like winter was in full swing. 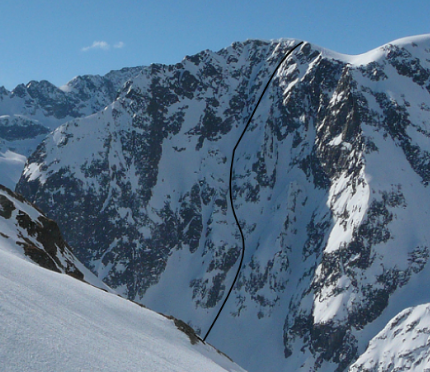 As with every year I like venturing into new corners of the Massif to find new lines that I have yet to ski. This is always condition dependant, but this year the conditions have led me to certain areas that I would have otherwise passed by without a thought. Couloir Chevalier was the first line of 2016. I had been to the top of this a couple of years ago but had to turn around because of the poor build quality of La Sportiva ski boots. Returning to this line in good snow and with Mikko and the Finns was a great morning out and it felt good to get back on the steeps. Table Couloir, Aiguille du Tour . This was my first alpine route and I have wanted to return for 4 years. Heading up there with Tim was great even though it is a long way away from the top of Col du Passon and was a real slog up with deep powder. It is a great small, steep line that rarely gets skied because its not that long and quite far away. Mont Oreb North Face was next. Skiing with Mikko and Jesper is great, they always have a plan B. After we were turned around at the midi with ideas about a nice little line we headed back to the cars and straight over to Buet. Smashing the climb up we were treated with powder down this steep and exposed face and a nice little ski back to the car. Tricot NE Couloir is located near Bionassay on the other side of Les Houches. 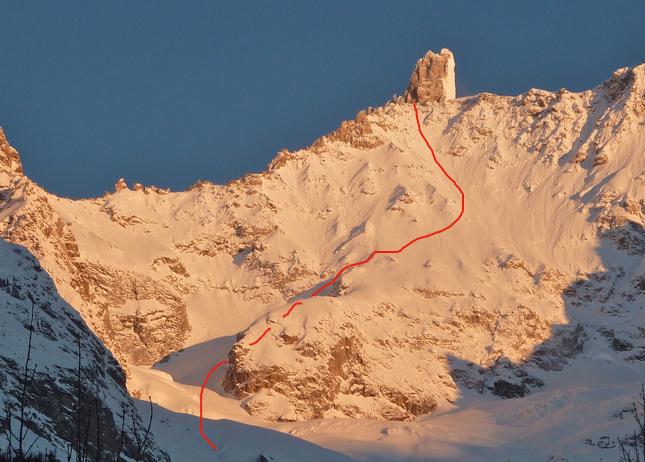 This was a new area for me after only seeing this line once when I skied trapper last year. A beautiful little steep tucked away from the crowds of the Chamonix Valley. Dent du Geant South Face started what almost felt like spring. Corn decent down to the Italian valley below. Warm temperatures had transformed the snow and with little else to ski it felt right to tick this classic off the list. When the clouds came in it did make route finding difficult but with a big cliff below we knew traversing high was the only option. Les Courtes NE Spur is one to return to. Although we made it 2/3rds of the way up we had to stop at the choke because there was too much powder pouring down the face. It made crossing the slough dangerous. Nevertheless we were rewarded with several hundred meters of deep cold snow on this classic steep north face. 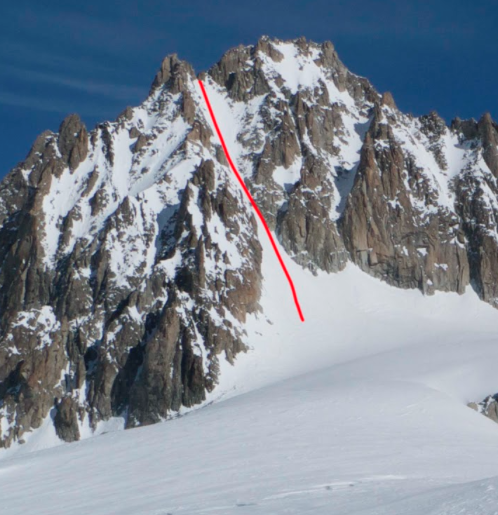 Mont Mallet West Couloir is a little known steep line tucked away below the Dent du Geants north face. Deciding to climb the line first we put ourselves in the firing line of some very big searches and in a wild and impressive little corner of the Massif. What Mikko considered as a training day was one of the highlights of my winter. Col de la Aiguille Vert was my baptism into real ‘extreme’ skiing, my first 5.4. This rarely skied line is over 50′ for its entirety and you get a real feel for its steepness when your standing at the top. Cold snow and good company made the day feel a little tamer than it should have been and it felt easier than some other less steep lines I have skied in bad snow. It goes to show that the snow quality is what can change a grade. 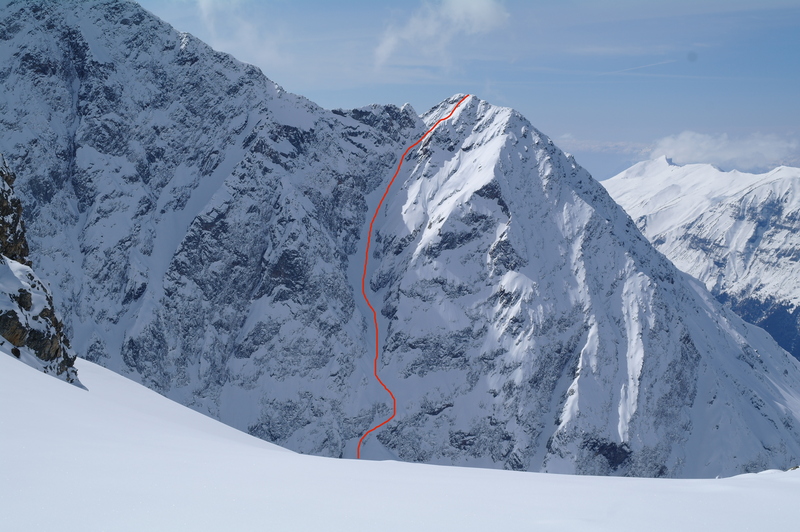 Tour Ronde North Face is another classic alpine climb I have done that I had always wanted to return to with skis. This spring it happened and after flying up the Gervasutti in no time at all we were staring down the upper face in boot top cold powder. What a descent. Skiing above the mandatory raps your mind is telling you you can’t fall the whole time. Once off the rope on the lower section your mind eases and you know you have passed the exposure test. 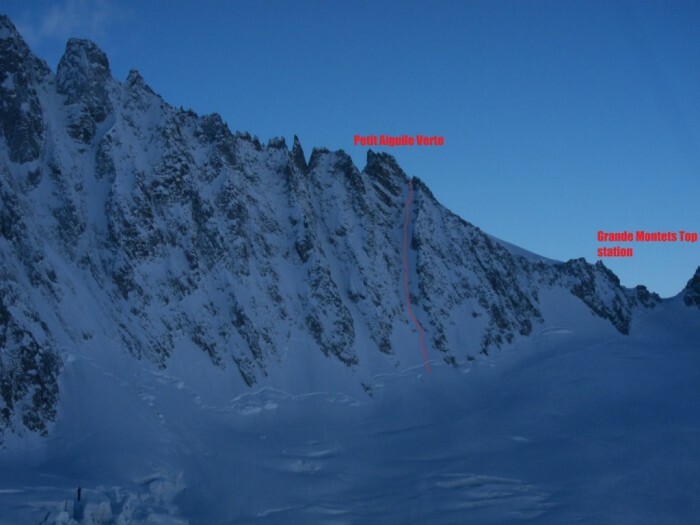 Mont Blanc du Tacul South Face is about as technical a line as I have skied. Weaving in and out of couloirs and with a few abseils thrown in for good measure it made for a gripping descent. Add to that a 5.4 grade and some hard snow on the cruxes and you have the most challenging day on skis for me. When the face started to pour down on us in the lower section it started to get scary and we were glad to make it out safely. Possibly the last day on skis for me this year, I will have to see what the conditions are like when I return in June after a couple of weeks back in the motherland. Another great winter has past with some epic days and also some scary ones. It has been great to explore more areas close to home and to make the most of my skis from Voile, they have been everything I have wanted and more. This summer will be more about climbing and moving faster in the mountains and I’m glad to have Salomon onboard to help me achieve more of my dreams.